This year I am venturing into something new. I really want to move away from teaching math as a whole group to teaching it in small groups. I learned from my class last year that there is such a wide variety of skill levels in first grade. At the beginning of the year, you have kids that can’t count to 20 and others that can count over 100. So this is how I hope to reach all those skill levels. My school is on a 6-day cycle, instead of a Monday-Friday schedule. So with three rotations a day, students will get to each rotation every two days. Which means I get to see each group every second day. I have 25 students this year (eek... large class!) so I will have 6 groups of about 4 or 5 students. Here's a peek at my rotation chart. 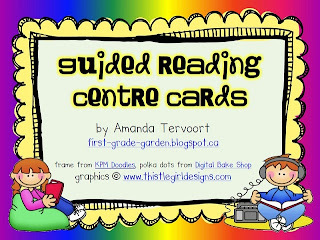 It looks the same for reading centres, so students will become very familiar with it. The 6 groups are numbered for math and letters for reading. There is a blank white spot under each group number where I can write the students' names with a dry erase marker. That way I can change my groups as needed. Hello, flexible grouping! Underneath each group card are the three rotations they will be doing that day. At the end of the day, I just need to rotate the group cards and we're all set to go again. Now I know the “sisters” are all about choice with the Daily 5, and I fully agree that students need choice in order to take ownership of their learning, but there’s a little part of me that just can’t let go all the way. So although the rotations kind of dictate what each student is doing, there is still choice within each rotation. It took me a lot of time to get organized, but I went through all of my math centres and activities (that I have created or bought or found online) and made a list of which ones were “By Myself” or “With Someone”. “Math By Myself” usually involves a lot of manipulatives and “Math With Someone” is all partner games/activities. I will have 10 different tubs available for students. Students will have their choice of which activity they want to complete by themself. I’m not going to require they do all the tubs, but if I noticed someone choosing the same tub each day, I might encourage them to choose other ones. These tubs will all be to reinforce concepts we learn in our small groups, so as long as they are practicing one concept, I’m not worried if they don’t get to all of the tubs. I try to make them all super fun anyways, so they *want* to get to each one. ;) I will slowly introduce these in September as we are getting into our routine. As the year progresses, I will start replacing the tubs one at a time. I will see which tubs are not being used as frequently or which skills they seem to be mastering, then I can add in new skills and new centres. 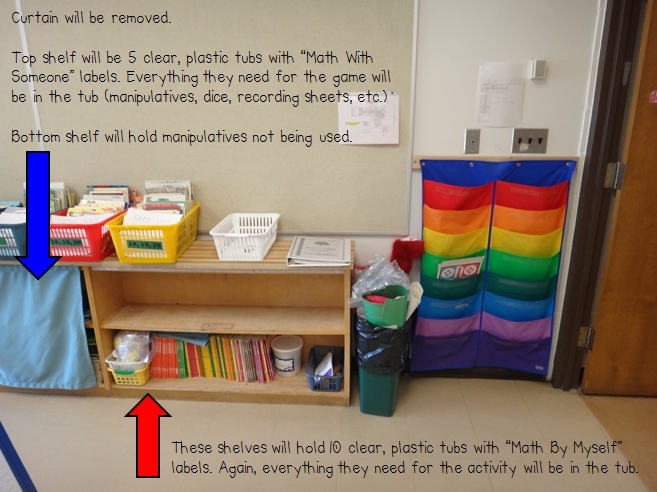 I am lucky to have some shelving in my new classroom where I can store all of my tubs. If you don't have the space for that, you can use those plastic drawer units. They would work quite nicely for centres as well! (Can you see the stack of bins in the back? That's only 1/4 of the stuff from my classroom. For this rotation, I will have 5 choices of partner activities. We will spend a lot of time in September talking about proper partner “etiquette”--choosing partners, playing fairly, taking turns, following the rules, etc. Same as the above, I will introduce the tubs slowly and as the year goes on, switch them out with new tubs. This will be the time for independent math worksheets. The great thing about this is I can differentiate for my groups. If one group needs to work on number formation, I will give them some printing practice. If another group is starting addition, I will give them some addition practice. You could keep all of their work in a duotang or folder, but I think I will just make up booklets as I go along. I am lucky to be getting a Mimio this year (turns your whiteboard into an interactive board) so the group will have a few different games/interactive activities to do together on the whiteboard. I'll have to spend some time finding some good activities to use with this. This is where I will teach lessons to my small groups. So there you have it! A peek into the world of guided math... how I see it in my classroom anyways! :) Let me know if you have any questions. Once I get into my classroom and start getting it set up, I will show you some more pictures of how it all works and what centres I am going to be putting into the tubs first! 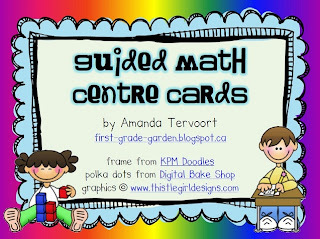 If you are interested in my rotation cards, you can get my math cards and literacy cards from TpT. Just click the pictures below. Aww! Thanks so much, Marissa. I really appreciate it! I love your ideas about math rotation centers! I have nominated you for an award, stop by Hip, Hop Hurray! Tales of the Reading Rascals to check it out! Hip, Hop Hurray! Tales of the Reading Rascals! Love your Math ideas!! I am always trying to find new ways to make Math exciting and I think this would do it! Your Math writing could be with a journal where they could write their own story problem to match a number sentence or cutout pictures to create a graph that interprets a story. They could add to their journal each day. Just a few ideas. :) Love your blog! Leah, those are great ideas for Writing About Math! I will definitely have to add those to the list. Thanks for stopping by and sharing your ideas! Thanks for the great ideas! This really helped me understand the workstation model better. So, wait, you're in school 6 days a week instead of 5?? Thanks for stopping by! We aren't in school for 6 days, but our schedule is set up on a 6-day cycle--meaning our specials, computer, library, etc. are scheduled throughout six days. Our schedule is determined by Day 1, Day 2, not Monday, Tuesday. The cycle just continues on the days we are in school. So instead of having music every Monday, we have it every Day 1. Most schools in Manitoba, I think, are on a schedule like this. Hi there, I just found your post and noticed that you were looking for some good websites to use with your Mimio. I was lucky enough to have one last year when I taught Kindergarten and know how awesome they are! I found this great resource with my team called www.abcya.com and it has tons of math and literacy games/activities for the kids to play for grades K-6. This was great for us because it helped me differentiate my activities. My higher kids could do first grade games while those that still needed extra practice could play the Kindergarten games. I hope that you check it out if you haven't heard of it yet, and that you're having a wonderful year. Thanks so much for sharing! Monday Made It... I Made It! New Puppy Pics and Mr. Potato Head Freebie!